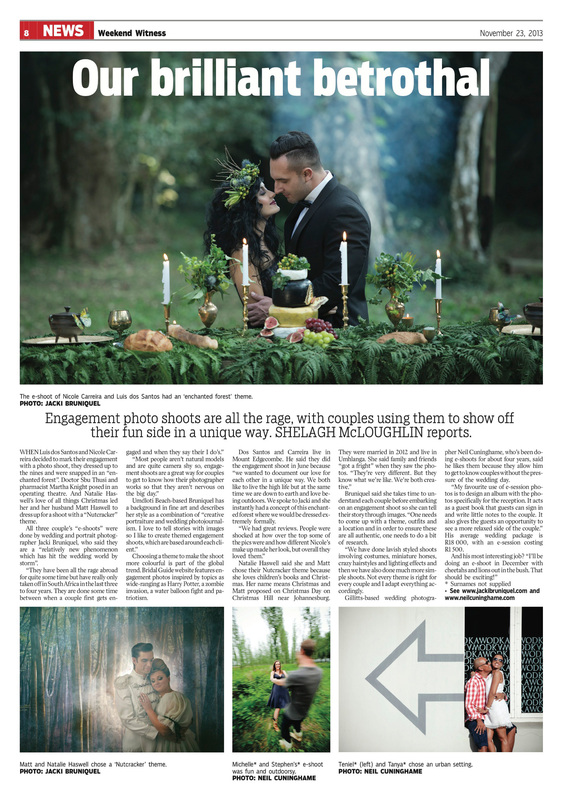 A while back Shelagh McLoughlin from the Weekend Witness contact me to do a little interview about Trash the Dress shoots I told her that I don’t do alot of those but that I do do alot of engagement shoots. She asked me to tell her a bit more! My name is Jacki Bruniquel and I am a wedding and portrait photographer with a background in Fine Art. I am based in Umdloti Beach Durban and I shoot all over South Africa and the world. My style of photography could be called a combination of creative portraiture and wedding photojournalism. Besides shooting weddings I also do a lot of couple portraits or engagement shoots. 2. What is the intention of an engagement shoot? An engagement shoot or “Eshoot” is a relatively new phenomenon, which has hit the wedding world by storm. Engagement shoots have been all the rage abroad for quite some time but have really only taken off in South Africa in the last 3-4 years. It is essentially a couples portrait session which is done some time in between when a couple first gets engaged and when they say their I do’s. Most people aren’t natural models and are quite camera shy so engagement shoots are a great way for couples to get to know how their photographer works so that they aren’t nervous on the big day. There are many different styles of photography, and different photographers will have different approaches. I personally love to tell stories with images so I like to create themed engagement shoots, which are based around each individual client. The purpose of an engagement shoot is to make memories, have some fun, create some art and get to know your photographer! My couples have used the images for Save the Dates, Wedding Invitations, Thank You Cards and Wedding Guest Books; they have hung images up in their home and of course used images as new Facebook profiles! 3. Is an e-shoot separate from the wedding shoot or do you do them as a package? Some of my wedding packages include engagement shoots. I find that when I spend time with my clients and get to know them before the wedding, I am able to produce better images on the wedding day, so I do encourage people to go for it! 4. What’s the most interesting/fun/bizarre request you’ve done? I worked with a couple who were both in medicine so we did their engagement shoot in a hospital theatre! I have also done engagement sessions in India and Hong Kong! 5. How much preparation and time spent shooting do engagement shoots take? I take time to understand each couple before embarking on an engagement shoot so I can tell their story through my images. One needs to come up with a theme, outfits and a location and in order to ensure these are all authentic, one needs to do a bit of research. We have done lavish styled engagement shoots involving costumes, miniature horses, crazy hairstyles and lighting effects and then we have also done much more simple shoots. Not every theme is right for every couple and I adapt everything accordingly. It also really depends on how much time and money a couple is willing to invest in their shoot. The other photographer featured in the article is Neil Cunninghame.